Night in the Ruts is the sixth album by American rock band Aerosmith. Joe Perry left the band midway through the recording of the album. The album was initially produced at the Bands Warehouse/Rehearsal space by Jack Douglas who had produced Aerosmith’s previous four albums, but later, Columbia Records brought in Gary Lyons to replace Douglas as the producer. About halfway through the recording of the album, due to mounting debt and the need for the band to generate an income, the record label and management set Aerosmith out on another tour without extra time to finish the album, which pushed the album to being released later in the year. Joe Perry left the band mid-way through the tour, after a violent feud involving the band members and their wives, and as drug abuse intensified within the band. Prior to his departure, Perry had completed guitar parts for “No Surprize”, “Chiquita”, “Cheese Cake”, “Three Mile Smile” and “Bone to Bone (Coney Island White Fish Boy)”. The guitar parts for the remaining songs were recorded by Brad Whitford, Richie Supa, Neil Thompson, and Jimmy Crespo (who later became Perrys official replacement from 1979 to 1984). Despite some critical acclaim and early success, the album quickly fell down the charts. The album has since achieved platinum status. Promo videos for “No Surprize” and “Chiquita” were filmed (featuring Perrys replacement Jimmy Crespo); however, these videos received little television airplay. “Chiquita” is available on the bands Video Scrapbook VHS and laserdisc release. The title is an intentional spoonerism of the phrase “right in the nuts”, which was subsequently the title of the tour, and was shown on the back artwork for the album. Singles Chart Position: 1979 “Remember (Walking in the Sand)” The Billboard Hot 100 at number 67 the song “Remember (Walking in the Sand)“, a song written by George “Shadow” Morton. It was originally recorded by the girl group The Shangri-Las, who had a top five hit with it in 1964. There have been many other versions of the song. A cover by Aerosmith in 1980 was a minor hit. A more rock oriented cover version of the song featuring uncredited backing vocals by Mary Weiss of the Shangri-Las. Chip Away The Stone should have been included on this album, rather than on the cutting room floor. I compare this album to my favorite Aerosmith album, Get Your Wings. Every song here is true Aerosmith, rotten to the core. Check out Three Mile Smile, No Suprise, Cheese Cake and of course, REEFER HEADED WOMAN. This album rocks and was almost completely overlooked. There was a slight hit with Remember (Walking In The Sand) an old Shangra-Las song. Do yourself a favor, don’t think about it, just buy this album. You’ll love it. Just good old-fashioned American hard-driving rock & roll, powerful and true. Even their cover of Remember (Walking In The Sand) on this disc had a good edge to it. I love every song, my personal favorites are the first two, No Surprize and Chiquita. Chiquita features a tough, gritty Joe Perry guitar riff, and Joey Kramer hits ’em so hard it sounds like he’ll put the sticks thru ’em. If you want to hear the REAL Aerosmith, before they went Hollywood, give this one a listen. 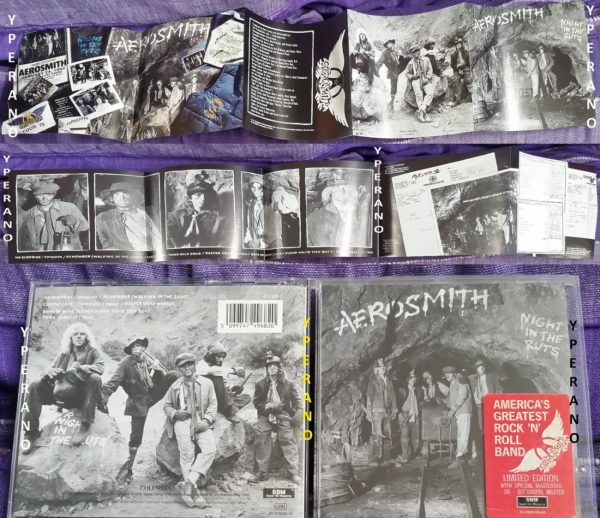 From top to bottom, I consider this one of Aerosmiths best albums and certainly up there with ‘Get Your Wings’, and their first, underrated self-titled album ‘Aerosmith’ (Dream On). Because of when in Aerosmiths history this record was made, it doesn’t get enough credit. Though bluesy with a few slow, tasty numbers like “Reefer Headed Woman”, the expressive “Mia”, and the surprise hit “(Remember) Walking in the Sand”, this is a rockin’ album with some straight ahead rock tunes like “Think About It”, “Chiquita”, “Cheese Cake”, “Three Mile Smile”, and “Bone to Bone”. The latter two sound like they could have easily come off the excellent “Rocks” album. Even “No Surprize” is catchy in its own way. And while it doesn’t appeal to all Aerosmith fans, “Think About It” is actually my favorite song on the record. For fans of Aerosmith at their hardest, most aggressive, it doesn’t get any better than this. For those of you who only know this album because of the hit “(Remember) Walking in the Sand”, there is so much more to this album than that song. In fact, I’d even go so far as to say that it is the weakest song on the record. Its also a cover of an old Shangri-Las song and not even an Aerosmith original! In summary, fans of early vintage Aerosmith should check this record out if they haven’t already. Its up there with ‘Rocks’, the first self-titled record, and ‘Get Your Wings’, and its better than the rest of them. This is their last album that has a true garage-door band nitty-gritty sound. Like Draw The Line, this is another Aerosmith gem that often gets overlooked. This is a solid slab of straight-up rocking (with a few funky moments per usual). People also think of this as the first album without Joe Perry. But hes actually on most of the tracks and a driving force behind the albums best moments (“No Suprize”, “Chiquita”, “Cheese Cake” and “Three Mile Smile”). Hell, even the few cuts without him are decent. I like their staggering, weary version of “Remember (Walking In The Sand)”. Overall, the album has a smoky, dark and majestic quality I really dig. These late ’70s albums of Aerosmith are exactly the kind the Stones should have been recording after Exile.